Connecting With Clergy: Stepping Stone to Treatment? Clergy may be a valuable conduit to addictions treatment in some communities. Is connecting social workers with local clergy an underutilized resource? Churches can serve as strong pillars of local communities. They can provide great support for members seeking help for various problems. But are clergy truly equipped to handle some of the issues their congregation members may share? After all, clergy have spiritual training, but they’re not psychiatrists, social workers, or other professional counselors. Considering a new study has found that individuals with alcohol use disorders (AUDs) in some communities are seeking the help and services of clergy members, the answer is yes, clergy may be capable of providing meaningful assistance. According to the study, which was conducted by researchers at the University of Michigan Health System and Saint Louis University, among 1,910 people with an alcohol-related problem who sought help, 14.7% said they used clergy services. While professional services are used more commonly than the counsel of a clergy member, the findings demonstrate that clergy services are an important part of the overall system of care for a person with alcohol-related problems. The study also found several factors associated with an increased likelihood that an individual would seek the help of clergy services, including being black, being aged 35 to 54, having a lifetime history of alcohol dependence, or having a major depressive or personality disorder. Researchers believe the study findings are encouraging in the fight against alcohol-related problems considering the statistics on alcohol treatment. Based on the Substance Abuse and Mental Health Services Administration’s 2007 National Survey on Drug Use & Health, the majority of those who needed alcohol treatment either did not perceive the need for treatment or did not receive it. Still, the question lingers as to whether clergy members—though often trusted members of the community—are qualified to sufficiently handle the needs of these individuals. Many may believe they are, but it ultimately comes down to each clergy member’s background and training. The researchers believe that the ability of those with an AUD to come forward and speak to a clergy member about their problems may be a first step in diminishing their barriers to treatment. Those who enter treatment are typically referred from other settings, such as a primary care or mental health provider. Others may enter treatment when ordered by the criminal justice system. But it may be the help and guidance of a clergy member that eventually leads an individual into treatment. There’s no question that clergy members are in a unique position to potentially recognize problems and provide help to individuals who need it, says study researcher Brian E. Perron, PhD, an associate professor in the University of Michigan School of Social Work. What makes ministers, priests, and rabbis a good source of help is that they are involved in their communities, know their congregants well, and see them on a regular basis, so they may be the first to notice something is “wrong” with an individual. Of course when a person seeks counseling from a clergy member who is part of the same congregation, a dual relationship between the individual and the clergy may result since they will likely see each other during one-on-one counseling and in other social contexts, says Bohnert. However, that is something any clergy member has likely become accustomed to handling. “Since clergy must often deal with complex dual relationships with congregants who also seek counseling from them for any number of reasons, confidentiality is particularly important, especially for counseling on alcohol use problems and other similarly stigmatized conditions,” she says. How a clergy member tries to help an individual with an AUD may be very different from the approach a social worker or other mental health professional would take. It’s plausible that some clergy may make an alcohol abuse problem more of a faith issue rather than a clinical one. However, that’s not to say this approach wouldn’t be effective, but whether it is appropriate is not within the scope of this article. Another key finding of the study was that the majority of individuals who used services from clergy at some point also used professional services (eg, Alcoholics Anonymous, psychologists, social workers). In fact, only 0.5% of individuals studied used clergy services exclusively for their alcohol abuse problems. Bohnert says the study did not address whether clergy offered referrals. But from this study, she sees an opportunity for social workers to connect with local clergy. “Outreach by social workers and other service providers to clergypersons could increase referrals in a way that would be helpful to the individuals seeking help,” says Bohnert. This raises an interesting concept—social workers connecting with local clergy in order to provide more comprehensive help. It’s a connection that may currently be underutilized. However, it’s important to consider that a tighter connection between social workers and clergy may also warrant a stronger understanding of how faith plays a role in some individuals’ treatment. “In some ways, the health and social service professions need to be prepared to better understand the role of religion and spirituality in relation to physical and mental issues,” says Chatters. “The most recent Gallup Poll indicates that the American public is very religious, certainly as compared to other Western societies. Conversely, it’s equally important that clergy members are aware of what professionals such as social workers have to offer. They should be as open to the idea of an individual seeking professional help as professionals are to the idea of their client seeing a clergy member. Of course it’s even more important that clergy know when it’s time to refer an individual for further help. Chatters says research seems to support the idea that clergy members would know when a problem is beyond their ability to help, but whether they actually reach out for additional help is again dependent on each individual clergy member. “At least one small study that I am aware of found that clergy were clear in making distinctions between the types of problems that reflected the need for spiritual/religious care vs. those that should involve professional social services, including addiction services,” she says. The “partnership” between a clergy member and a social worker could potentially be quite effective in helping an individual since each has his or her own expertise to provide. A clergyperson can offer the spiritual guidance an individual may seek while a social worker or other helping professional can provide the necessary clinical support. 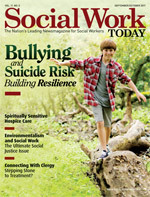 Since both the clergyperson and the social worker may see the same individual simultaneously—and offer help—it’s important that there is a sense of working together. While the study indicates that the large majority of those seeking help from clergy also sought help from another professional, this scenario may have the potential to change. That half-percent of individuals who exclusively sought the help of a clergy member could grow. “I would venture that the percentage of persons who only seek clergy assistance could grow dependent upon cutbacks in social service funding and treatment for substance use,” says Chatters. “Also, evidence indicates, for a variety of reasons, racial and ethnic minorities are traditionally underserved in the specialty mental health sector, giving rise to disparities in care and treatment.” It’s all the more reason for an increased understanding of the roles clergy may play in the treatment of individuals with AUDs.